Whether you just want a snack, or to entertain guests, this Pea Puree and Caramelized Onion Toast will fit the bill. They are delicious and satisfying – plus also easy to make! I used a pea puree I made from yellow split peas, but you can also use plain hummus if you like. You can check out my homemade hummus recipe here. If you love caramelized onions as much as I do, you will also love this recipe. It’s one of my faves! I used Dave’s Killer Bread to make the toast. My kids just love it. It’s a very seedy bread, and the seeds add a great crunch/texture to this recipe. If you are gluten free, feel free to use another bread if you like. The perfect starter for any meal, or make as a quick snack! In a large saute pan , add the onion, oil and sea salt. Cover and cook on med-low heat. Make sure you stir often. It should take about 20 minutes to caramelize the onions. In a small saucepan , add the peas and water. Bring to a boil, then turn down, cover and simmer until all the liquid is absorbed. Strain off any remaining water and transfer the peas to a food processor with the garlic, lemon juice, tahini and a pinch of salt. Blend until smooth. Set aside until the onions are done. Once everything is read to assemble, toast the bread in a toaster, or in the oven. 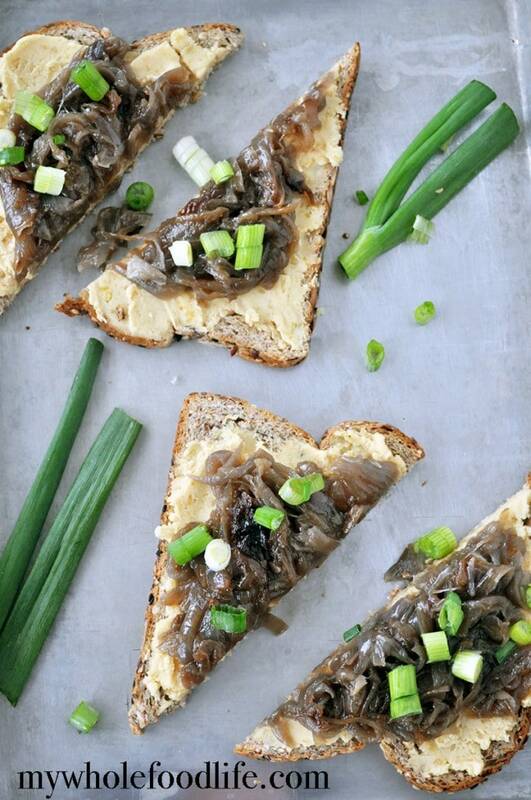 Spread the pea puree onto each slice of toast and add the caramelized onions on top. Once all are done, garnish with green onions or fresh parsley, slice into triangles and serve. If you want to make the onions or pea puree ahead of time, please do so. However, do not toast the bread until you are ready to eat/serve. The pea puree and onions should keep in the fridge for at least 5 days. Enjoy!